It was time to stop experimenting for a few days and cook and bake some good old classics. Since I used lots of orange zest in my Christmas bakings, it has become one of my favorite flavors. In fact, these muffins with orange zest, dried cranberries and pistachios were our Christmas muffins, the moistest, fluffiest muffins ever, full of flavor and, I dare say, disaster-proof. 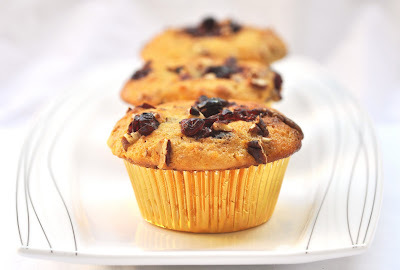 As Christmas is over now, I just call them Orange Cranberry Muffins. Simple as that. Bon appetit! Preheat oven to 200C. Line muffin tins with muffin liners. Combine flour, salt and baking powder in a bowl and stir well. In another bowl, mix buttermilk/yogurt, canola oil, agave syrup and eggs. Combine wet with dry ingredients and stir until just blended. Don't overmix. Fold in orange zest, cranberries and pecans. Keep some of the cranberries and pecans to garnish the tops of the muffins. Spoon mixture into the muffin cases. Top with small amount of chopped pecans and cranberries. Bake for about 20 minutes. Let cool a little before dusting with icing sugar (if desired).